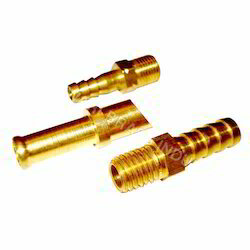 Leading Exporter of brass nozzle from Jamnagar. We offer Brass Nozzle that are utilized in a multitude of industrial applications. These are characterized by dimensional accuracy and long shelf life and are created under the close supervision of domain experts. These have an excellent finish and are highly resistant to corrosion and abrasion. We readily provide these in bulk quantities and at market leading prices. Specification: Material: Brass Thread: BSPT Total Length: 18 mm Size: 1/8" to 28"